Tomorrow daylight saving begins. That reminds me of spring and spring weddings. Nowadays, every time I call back home to my parents, I hear either one of our cousin or family friend is getting married. From next month, with Assamese new year starting, wedding seasons begins too. One beautiful lightly rainy spring day we tied the knot too, about sixteen years back. I can't believe how time flies. Indian weddings are rhapsody of colors when it comes to outfits or dressing up. There are a plethora of opportunities to dress up. Dressing up is one of the great attractions in any wedding, whether you are a family member or friend. Spring is the season when flowers bloom and trees perks up with leaves and keeping up with nature and warm light downpour days, you dress up. Usually bright and pastel color looks great in Indian weddings. I personally avoid red as most Indian brides wear red as tradition. Wearing red sometimes might overshadow the bride. Pink, yellow, teal, turquoise are great for spring Indian weddings. Stay on classics pieces are always easy on the pocket. As you can repeat and reuse it for years to come. In spring you can always opt for flowery prints as it never goes out of style. It's very romantic and feminine as well. Spring defines flower too. For accessories, you can use flower too. Here is my inspiration for a spring wedding. 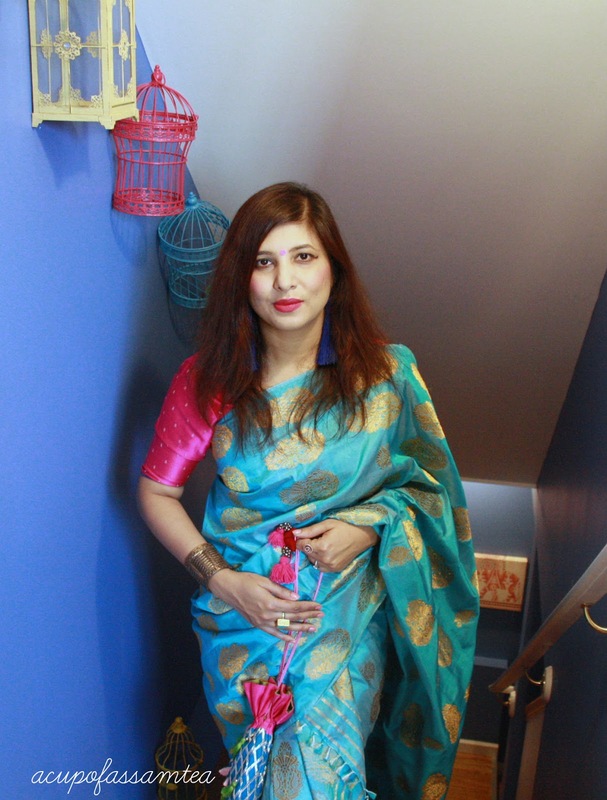 Here I am wearing a turquoise blue mekhela chadar teamed up with hot pink blouse. As I am wearing all bright colors, I chose to stay easy on accessories. Wearing thick Assamese bangles called gam kharu, a bright turquoise potli bag and a cocktail ring. Let me know how do you guys like it and also what is your spring wedding outfit inspiration. Stay tuned for more. I love the pairing of the bright pink and turquoise! Such bright and happy colors! I have never been to an indian wedding but i have read quite a lot about them! a few friends of mine are indian and also told me a bit about them! I am loving the blue on your outfit! so bright and beautiful! Yes, spring is fortunately coming and those colors are beautiful! Your outfit is beautiful. Love the colours. I like that Indian weddings are so colourful and are a whole ritual. I have been to India and I have tried out once the sari there. Love it, elegant and classy! Your turquoise really look great with the pink, it has a contrast of color which make it so fresh, exactly like the spring vibe. I love the color combination a lot, even not with a Sari, I can do it with any other outfit too, thanks for the inspiration! The color combination you have chosen is beautiful. I always try to pick a wedding outfit that will be classy and ready for use for years to come, and this one looks like it will work wonderfully for you! Love the bright colors. Beautiful gown that you wear so well. I never knew that Indian brides wear red. That's good to know in case I get invited to an Indian wedding in the future. You never want to do something offensive at a wedding. What a great choice, I love the colour combinations. This mekhela chadar is just right for a Spring wedding! What a beautiful dress! I have taken part in an Indian wedding two years ago and my dress was a bit different. I do love the blue and gold colors though, and you look wonderful in the dress. Your choice of outfit is absolutely stunning. The colours are amazing and look lovely on you. I love your choice of colors and fabric! The pink and turqoise are just perfect for spring. And yes to going low with accessories. I like how you chose just the bangles and the purse. So Pretty! You look amazing. I really love the pop of pink and the gold leaf detail. Indian national clothes is probably the most beautiful one. Or second: I have a hard time deciding between it and Japanese Kimono. You look beautiful, the color scheme complements you lot. Iam Indian & just love Indian attires...gorgeous Saree combination ..looking beautiful !! I love watching indian weddings as they are so colourful! This outfit you put together is gorgeous I love the colours and the touch of gold! I think yellow, teal, and turquoise are perfect colors for attending an Indian wedding. I love all the colors on your outfit! I think Indian wedding attire is always so gorgeous! I love that at Indian weddings the bride wears red. So many bright and beautiful colours! I think all weddings should be like that! Your outfit is gorgeous. My girlfriend told me once how expensive these outfits are and I realised that it never occured to me the effort and cost put into the design. Nice suggestions and colour recommendations! You do have some great colors for a wedding. I really love the way the turquoise and gold mesh. I just love the ornate Indian dresses. Such a pretty outfit. Yes I agree, colorful is great for a nice, spring wedding. You looked gorgeous. I love the colors on this outfit. You really chose a very flattering design which looked really nice on you. That is such a beautiful Indian wedding gown I love the color combination of it. You looks gorgeous also. Its awesome looking sari, being from India I can not wear it so professionally as you have done it , I need help of so many people . Glad you chose bright blue color. Looks great. I think saris are so beautiful. I love that color on you! Sarees are pure love!!! Very graceful!